Clean and Green is a group of volunteers who are trying to actively manage plastic waste and ensure that it gets collected and well-used, at at least one tourist location near Bangalore. A simple agenda for improving our environment…I am very impressed with the way Clean and Green functions. 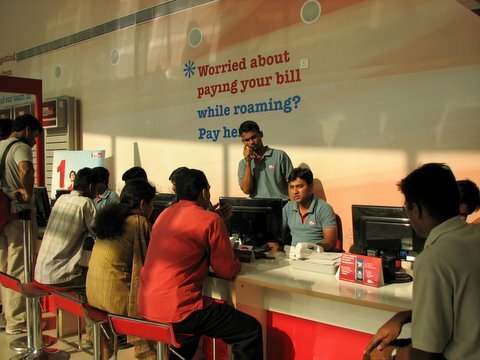 This is the Airtel office on Bannerghatta Road, near the Jayadeva flyover. True to the “modern” trend in architecture, the facade of the building is all glass; but look at the effect on the inside. Since one entire wall is glass, the afternoon/evening sun pours in through it. This is all very well for cities in cold countries where sunshine is a rare commodity, and buildings need to be heated. But here, where the mercury yesterday was at 34 degrees Celsius, it meant a huge volume of space where things were very uncomfortable. The customers also have to sit in the sun, but at least they have their backs to it..and they are there for far less time. 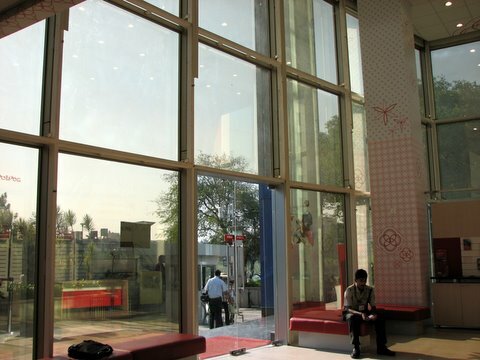 The Airtel office is air-conditioned; I can also guess at the amount of energy and electricity it must be taking to cool down the space heated by the glass design of the building. The architect who designed Jal Bhavan (it’s the building in the dead centre of that map, next to that “pleated” building) has said that glass is a bad material for architecture in India; it heats up the inside of the buildings, which then have to be cooled down at enormous cost in terms of electricity/energy. Having been in the Airtel office, I would tend to agree.